Above Commercial stream projects are also available as illustrated by this project. A newly built wedding venue south of Greensboro, N.C. , included a water feature made up of two streams that are close to 30 feet long with around 10 waterfalls within only an eight foot drop in el- evation. Rex McCaskill of Pond Professors and a crew of four installed the streams that were designed by Tucker Beeninga of Next to Nature Landscape Design Inc. Water feature equipment manufacturer Blue Thumb advises that when excavating the basin area for an underground reservoir, save the dirt to build up and create waterfall areas. Also, leave an overhang of at least a few inches of the liner around the entire perimeter, which will allow for adjustments caused by any settling. Hide the extra liner with rocks, gravel, mulch and the like. July 2017 29 and set down into the slope as opposed to being built up on both sides," White says. When the project calls for it, and access is read - ily available, machines are called upon for the prep work. Scott Conner of Scott Conner Landscape used a mini-excavator on two of his recent projects in Par - adise, Calif., about 90 miles north of Sacramento. One included a water well, whose excavation he has this advice about. "To get the underground reservoirs large enough, you have to correctly calculate how much water is going to be in the streambed." 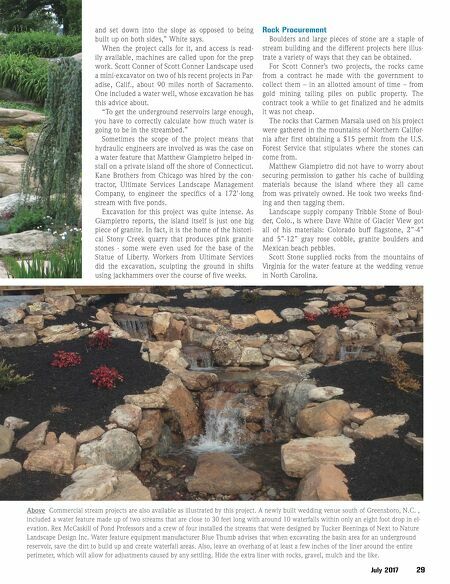 Sometimes the scope of the project means that hydraulic engineers are involved as was the case on a water feature that Matthew Giampietro helped in - stall on a private island off the shore of Connecticut. 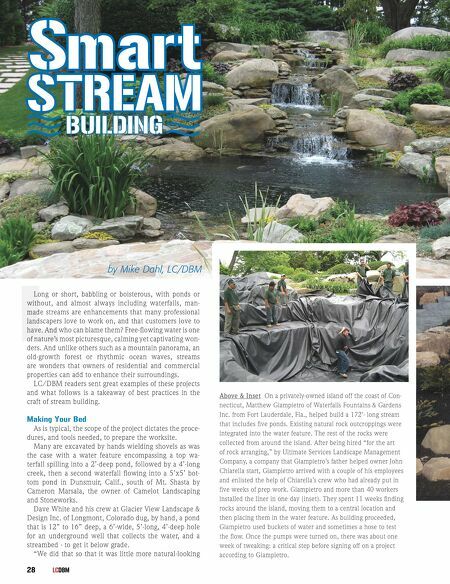 Kane Brothers from Chicago was hired by the con - tractor, Ultimate Services Landscape Management Company, to engineer the specifics of a 172'-long stream with five ponds. Excavation for this project was quite intense. As Giampietro reports, the island itself is just one big piece of granite. In fact, it is the home of the histori - cal Stony Creek quarry that produces pink granite stones - some were even used for the base of the Statue of Liberty. Workers from Ultimate Services did the excavation, sculpting the ground in shifts using jackhammers over the course of five weeks. Rock Procurement Boulders and large pieces of stone are a staple of stream building and the different projects here illus - trate a variety of ways that they can be obtained. For Scott Conner's two projects, the rocks came from a contract he made with the government to collect them – in an allotted amount of time – from gold mining tailing piles on public property. The contract took a while to get finalized and he admits it was not cheap. The rocks that Carmen Marsala used on his project were gathered in the mountains of Northern Califor - nia after first obtaining a $15 permit from the U.S. Forest Service that stipulates where the stones can come from. Matthew Giampietro did not have to worry about securing permission to gather his cache of building materials because the island where they all came from was privately owned. He took two weeks find - ing and then tagging them. Landscape supply company Tribble Stone of Boul - der, Colo., is where Dave White of Glacier View got all of his materials: Colorado buff flagstone, 2"-4" and 5"-12" gray rose cobble, granite boulders and Mexican beach pebbles. Scott Stone supplied rocks from the mountains of Virginia for the water feature at the wedding venue in North Carolina.